I like to photograph wild animals in their natural habitat and the Snow Leopard was very high on my wish list. 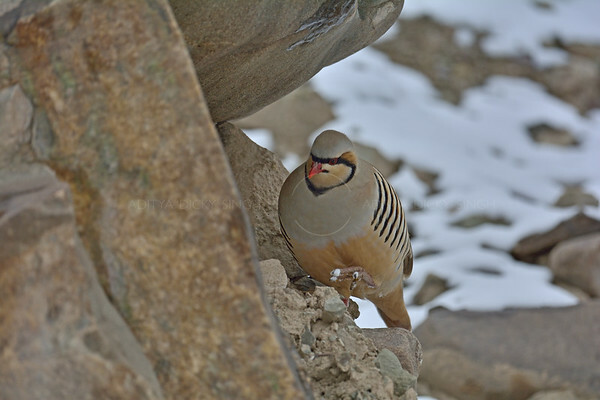 I have seen them on two different trip – first time a long ago in Spiti valley and then more recently in 2011 in Hemis national park. On both the trips, I saw more than one snow leopard from a long way away but never managed to get a single useable shot. 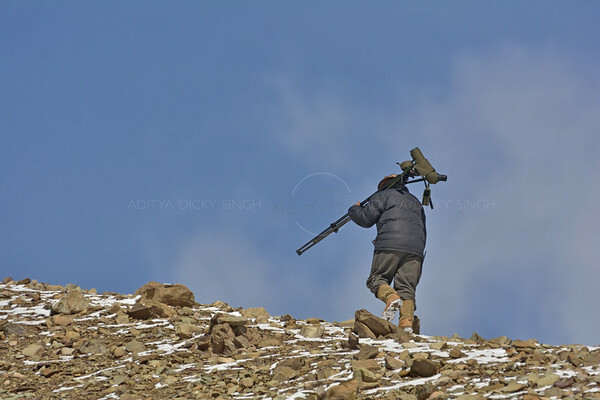 I did not even own a camera when I first saw them in Spiti and in 2011 when I had gone to Hemis with my brother Vikram and a close friend P Senthil, we saw them too but they were too far to get a half decent picture. I did get some pictures and till a few weeks ago liked them but now they are thrashed. When I planned the February 2014 trip with Vikram’s company – Wild World India – expectations of getting a half decent image were not too high. 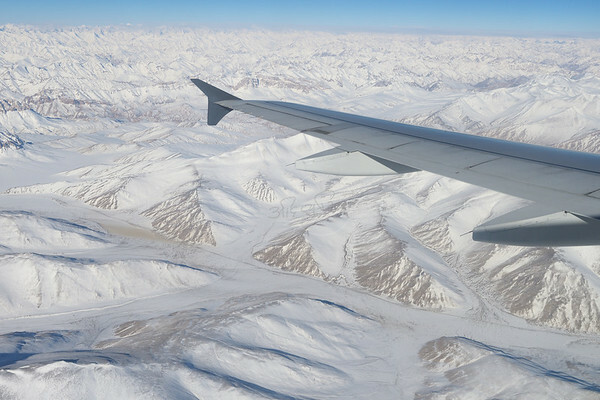 I flew into Leh airport in Ladakh with a friend Sanjay Khurana, who stays close to Barack Obama’s house somewhere across a lot of water. We were met in Leh by Vikram, who had been there for over a week. We checked into Mahey Retreat, one of the few hotels in Leh that is open in winters and planned to stay there for the next two night to get acclimatised. Leh is at 3500 meters or so and everyone from the plains would need some acclimatisation – two days is advisable. Three days before I got to Leh I had started on a course of Dimox medicines (two 500 mg tablets a day) that I stopped once I got to Leh. Dimox helps in the acclimatisation process though it could mess you stomach up. 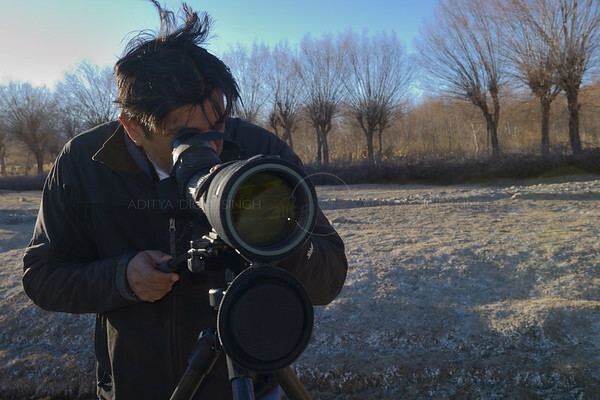 Vikram had just bought a super Swarovski ATX 30-70×95 spotting scope that Sanjay carried to Leh – the best piece of equipment that we had on the trip. We went out along the Indus River to test it out for the first time, where we saw one Solitary Snipe – my first lifer in this trip. 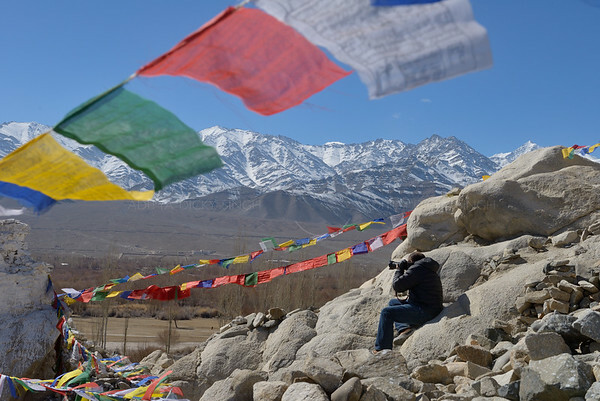 On the 13th February, two more photographer friends joined us in Leh – Chris Brunskill and David Baz Jenkins, who had flown in from near the little island where the Queen lives. Sanjay, Vikram and I went for a drive till the Shey monastery where we got some great pictures of a religious festival followed by some birding (mainly to try out the new scope) in the nearby marshes. In the evening we went for another short drive to the River Indus, where we walked around a bit. Ideally while acclimatising you should take it very easy the first day and then start walking around. The next morning we left for Hemis. 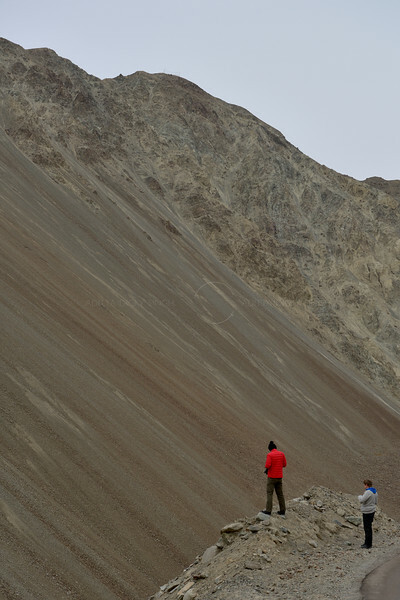 Two cars picked us up from Leh and drove us to Zinchen – the gateway to Hemis national park, about an hours drive from Leh. Just as we were leaving it started to snow lightly. 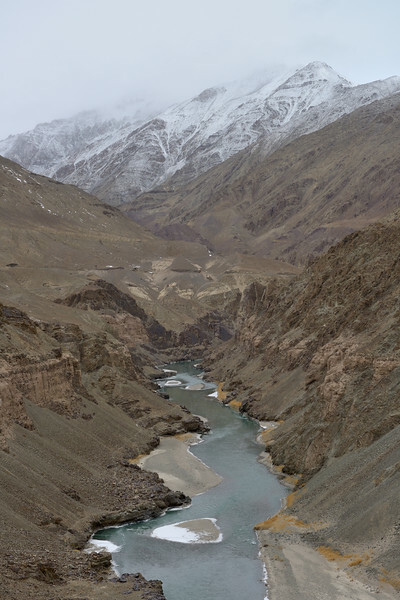 On the way we stopped slightly short of Zinchen to get some pictures of the Indus River flowing through barren rugged mountains – an imposing sight that puts you in your place. This is when pep up phrases like “never stop exploring” start going out of the window. The cars dropped us off in Zinchen where we were met by a pony train that carried our gear to the campsite. Its on foot from here till the last day when the cars come back to pick you up. The camp site is about 3 kilometres away, an easy walk, that does not appear anywhere easy on the first day. This is where you get your first experience of crossing frozen streams that can be very slippery. I have always “been had” by these ice patches, more so during the first few days. But like Mr Walker says – Keep on walking. Short patches of frozen streams are a task to cross during the first few days but then you get used to it. I kept falling. From Zinchen you walk about 2 kilometres up a very gradual slope till you get to the point where the Torbung valley is to your right. Here we saw a Eurasian Wren on our first day – another lifer for me. From here you walk another kilometre to the campsite, which is just before the entrance to the Hosing valley. The campsite is a narrow open patch of rocky land, next to a frozen stream, in a narrow depression that keeps the winds at bay. 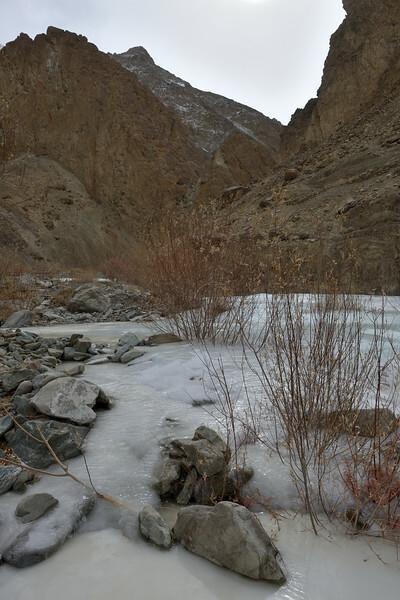 This is not the most romantic place in Ladakh. We had a great four season tent to each of us. There was a dining tent with an LPG heater (a life saver), a Kitchen tent and two dry pit loo tents. We had a team of four to help with the camp and food (which was top class) besides the three guides. When we reached the camp it was snowing and even though the temperature was not all that bad, I was really cold. We heard that two Snow leopards were seen a long way away two days ago for a few hours. On our first night camping it snowed about an inch and winds picked up. First night there and we could not sleep because of the cold, despite having state of the art sleeping bags. The next day was overcast with bad visibility and it was really really cold. We went to one of the lookouts in the Hosing valley – basically a highish position on the slopes – which is almost always a very cold place. We got some birds and Blue Sheep in poor light. After lunch we went to Torbung, which was a near white out. We did see many Blue Sheep, up in the slopes. Another evening playing cards and cracking jokes in the small heated dining tent and not many pictures to show for. 16th February was a nice clear day with a burning bright sun and very cold air – you could get sun burnt and frost bitten at the same time. There were many Blue sheep down in the valleys and it looked like a Shan day. 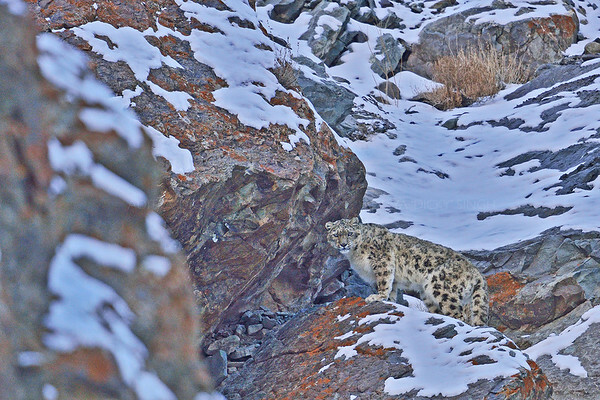 Snow Leopard is called a Shan in Ladakh. We spent the day scanning the hills around the Tarbung valley, while another team with another group was scanning the Hosing valley. Some one is always scanning around the camp site. 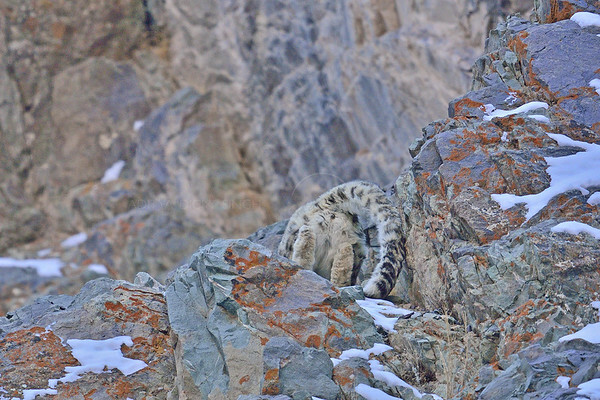 Finding Snow Leopards is not easy. You have to scan a rocky grey terrain from more than a kilometre away and it is best done with spotting scopes. We had the mother of all scopes, that everyone wanted to use. Most of the spotters in Hemis are brilliant. They can climb anywhere, run where we can not walk and will spend hours looking through the scope from very precarious perches. I shot some good Blue Sheep images and got a half decent time lapse sequence. No sign of Shan and another cold night coming up as clear nights are colder. Two more of our friends – P Senthil and Dinakar – were going to join us the next morning. 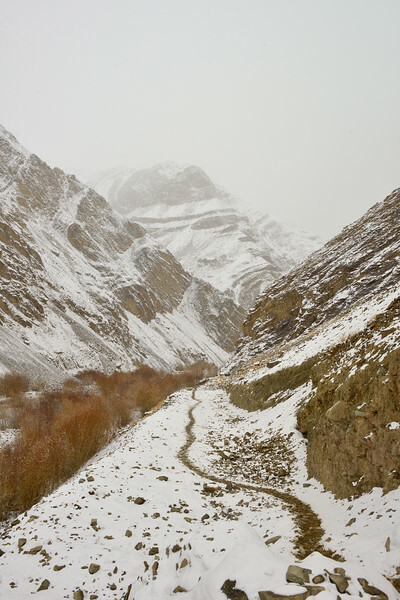 On the 17th morning the guides reported seeing pugmarks of two leopards near the camp heading down towards Zinchen. Everyone was off and assembled near Torbung valley, searching for the Shans. 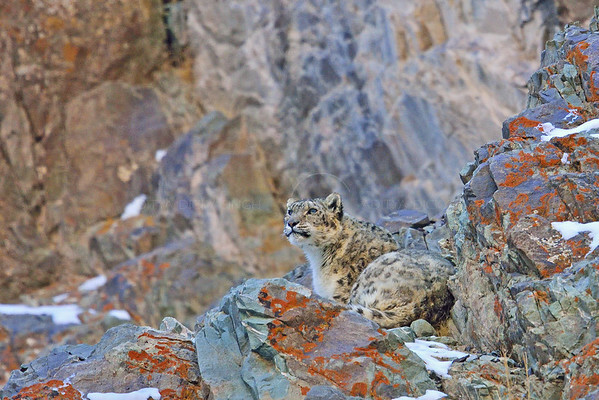 Our guide had spotted two Snow Leopards at the mouth of Torbung and lost them as they moved on towards Zinchen. About an hour later another guide found the two on the slope opposite the road head in Zinchen, where the cars had dropped us off. I still can not make out how he managed to “scope out” two resting cats, almost 3 kilometres away. We walked on towards the road head in Zinchen, where we saw Senthil and Dina getting off the car. 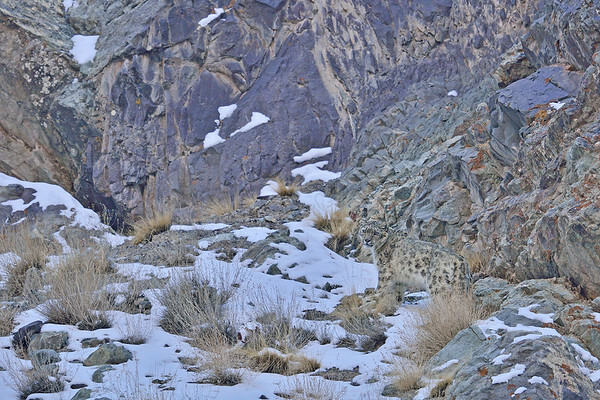 Talk about being lucky – they get off the car and get to see two Snow Leopards right away. Senthil has been photographing wildlife for a decade but this was Dina’s first trip to the wild and the first wild cat that he see in his life is a Snow Leopard!!! We set up our tripods and parked our rear sides hoping that the two cats would move from their resting place. They were really far off but this is how you see them most of the times. In the picture below they are just above the two white dots. 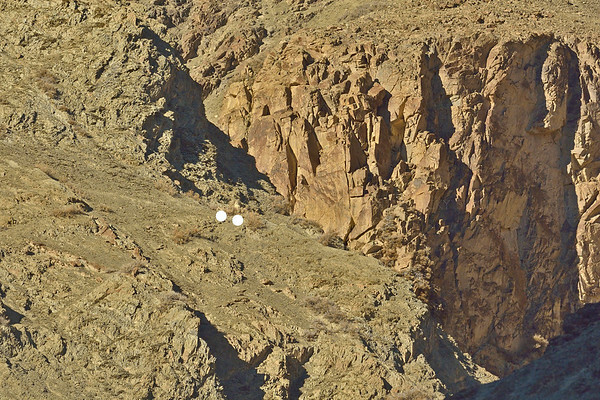 Our first sighting of Snow Leopards in this trip on the 17th February 2014 – we saw a mother and a grown up cub over a mile away (just above the two white dots). This is how you normally see them – no good fro most photographers. An exciting day but still not one decent shot of a Shan. That evening we were not so cold – the Shan had warmed us up and we were getting slightly used to the living conditions. On the 18th February we hit a mini jackpot. We walked down to Rhumbak village as the guides believed that the two leopards that we had seen yesterday could move in that direction. We found two Wolves near the open meadows near about a kilometre before the village. They were too far for any picture but good to see through the scope. This open meadow is a very scenic place where you can get a lot of wildlife (for Ladakh winter standards). 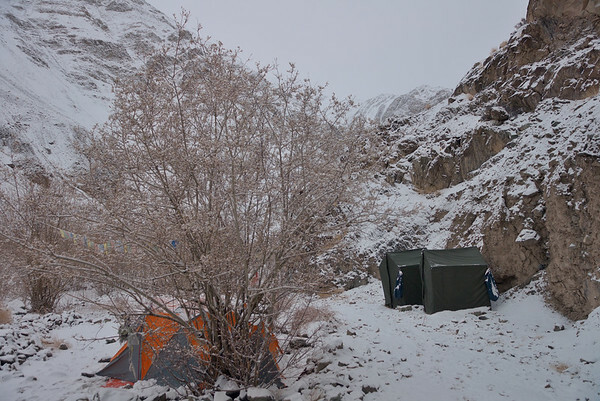 We stayed in this area till lunch, which the camp team delivers and while having lunch we heard that some guides had spotted a Snow Leopard sitting on a rock about a kilometre away, towards the camp. Lunch was over in a second and we all ran (which is reality means started walking as fast as we could). For the record Chris Brunskill and David Baz Jenkins ran off without their camera bags and requested the guides to bring them :). 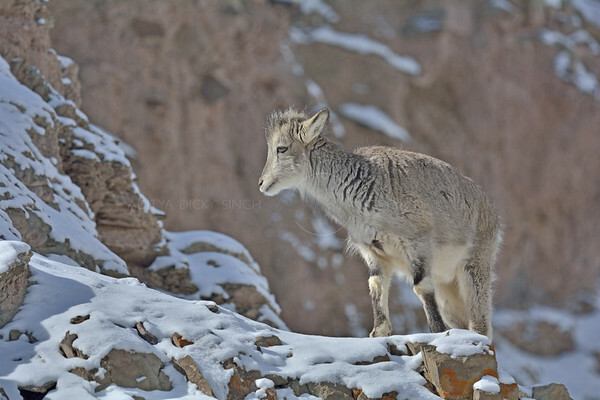 We got our first decent picture of a Shan soon after along the Rhumbak gorge. 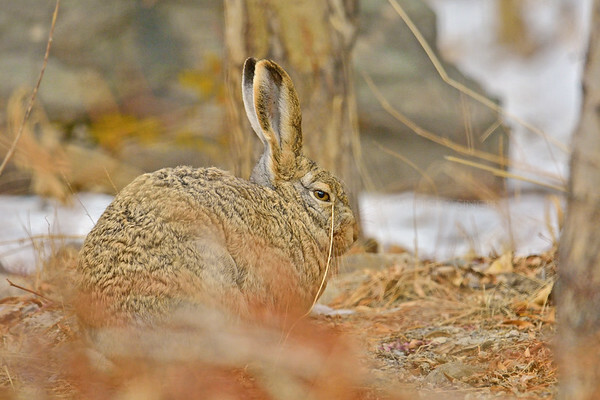 We hit a mini jackpot on the 18th February 2014 – when we got this one close by (for Snow Leopards standards). This could be bagged with a long telephoto. The story that we heard later was that one of the crew was getting lunch for his guest when he saw a small group of Blue Sheep running down a slope. One of the sheep was bleeding from the neck, a lucky one that got away from a Shan attack. This guy informed some guides and they scanned out a Snow Leopard resting on a rock in a cliff about a 100 meter above the valley floor. The path between Rhumbak village and the campsite runs along the valley floor along one side of the narrow valley while a stream flows on the other side. 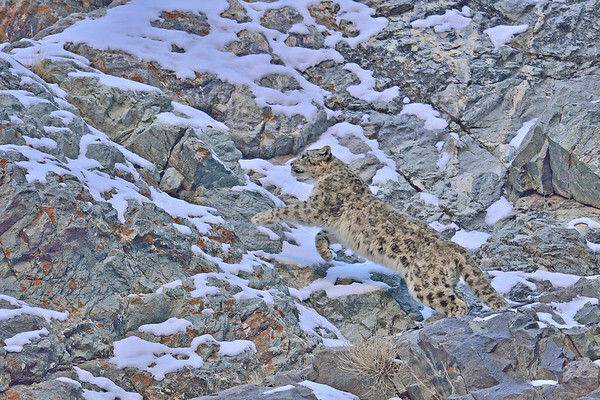 There are cliffs on either side of the valley and the snow leopard was on a cliff above the path. We could only see the cat if we went on the frozen stream. When she got up we realised that she was on female. David Jenkins later got some pictures that showed that she did not have two canines. The ice on the stream was frozen solid and sloping down. This part of the valley gets very little sun and cold winds funnel right through. While Chris and Baz got themselves a perch on a small landslide on the stream, sharing it with two others, the rest of us had to sit on the ice and shoot from there. I fell twice while getting across but finally managed to set up my tripod, get my 600 mm lens out and sit on the now empty bag. I soon realised that my tripod and the bag on which I was sitting were gradually sliding downstream. I stopped about 20 feet away when our guide, Tshering, dragged me to another small landslide on the stream. Tshering and Gurmet, our guides had to get all five of us set up one by one. Thankfully the Snow Leopard was sleeping and we did not really miss any action. She sat on the rock where we had first found her for a few hours, sleeping for most of that time. Late in the evening, when the sun was long gone from the narrow valley, she moved across a hill for about a hundred meters before we lost her. This was good. Once we were set up it was time to start shooting which was easier said than done. I was horrified when I realised that I could not even find the cat. I looked around and realised that none of the photographers (and there were about a dozen of us from three gangs) had found the cat as yet. It took us a long time to figure out where the cat was. Gurmet had to take a picture from my camera and then zoom in to show me where. All right I had found it and it was business time now. Again easier said than done. It was really cold, the metal Whimberly ball head, lens and camera were freezing. Beside my perch, in fact all our perches were not very stable. I was wearing two pair of gloves, an inner liner that had torn finger tips on my right hand (the camera hand) and an outer ski glove. The ski glove had to come off which left three of my finger tips exposed – the three finger tips that I was using to shoot. It could not have been worse than this. We were shooting from the worst possible place – perched on a frozen stream that was slippery and sloping down, sitting on very slippery ice with a tripod that was sliding down. The Snow Leopard rested for nearly two hours while we froze and got some boring pictures. Later in the evening she started stirring. This is what we were waiting for. The flip side was that the light had gone from the valley and it was getting painfully cold. If I did not have a Shan in my frame, I would have left a long time ago. She stirred for some time and called once before getting up. In the next five minutes she walked across a slope, jumped over a few rocks, stopped on a snow patch to have a look at us and then climbed this big rock before disappearing. We heard another Snow Leopard call out once this one was out of sight and a few people on my right saw both of them for a short fleeting moment. I WAS DONE for now. 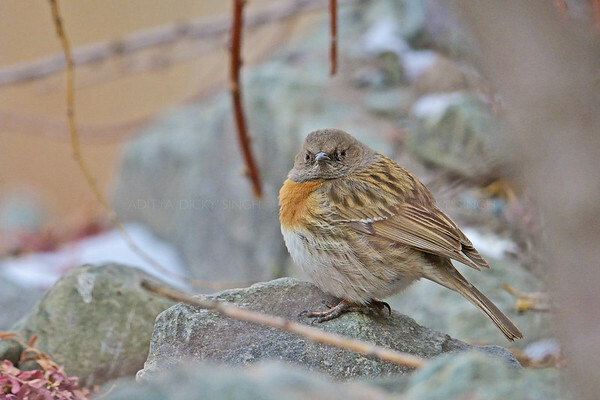 The last goodbye – she looked at us and then disappeared behind a rock. We had heard her calling and did see one more Snow Leoaprd when she went behind the rock in the background but could not get a picture of that one. It took us a while to pack up and get across the stream, with a lot of help from our friends. We were buzzed and happy – really happy. There was a big party in the campsite that lasted till late in the night and the next day the pressure was off. For the next few days I stayed close to the campsite and decided to go to the valleys only if I got some news. I did shoot a few birds, hare and got five very average time lapse sequences. 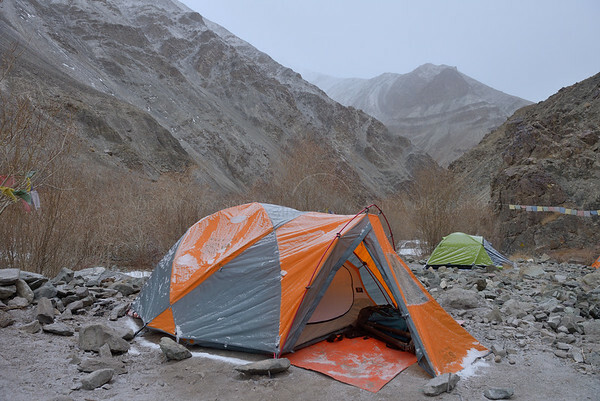 On the 20th night we did hear two snow leopards calling out to each other near the camp – music to our ears. I stayed in Hemis for another 4 days and left for Leh with Senthil and Dina, while the rest stayed on for another few days. I first got to see my pictures while in transit in Delhi and was happy. They are not the best pictures in the world, they are slightly grainy (shooting at high ISO on a Nikon D 7100 which I choose for the cropped sensor) and not as sharp as I would like them to be but I still love them. Will be back somewhere in the Himalayas or beyond next winter looking for another Shan – they can be addictive. We all had a bottle of hand sanitizer and I just carried my toothbrush along. Do not take Gel toothpastes as they freeze. This is about all the toiletries that you will need. Take a head lamp or torch along. Most importantly you need a really good sleeping bag. In Hemis the only two lenses that I would bother to carry would be my widest lens and my biggest telephoto, so I carried the 24-70 mm Nikon f 2.8 and the 600 mm Nikon f 4.0. I had two camera bodies the D 800 and a cropped frame D 7100 (for the reach). A 70-200 mm lens would have been handy but carrying all of this is not easy and I thought that it was not worth it. I carried the 600 mm lens and the D 7100 in a LowePro 600 trekker bag on my back, with the carbon fibre tripod and Whimberley head clipped on to the side of the bag – a very heavy bag that was a pain to carry. The D 800 and the 24-70 mm lens went in my small backpack, wrapped in the extra fleece layer. This bag would usually stay in the campsite unless one of the guides or Vikram offered to carry it. I had eight 32 GB memory cards, as time lapse sequences are card guzzlers. If you are not shooting time lapses or videos then one of two 32 GB card would be all that you would need. I had carried 6 batteries that were fully topped up in Leh and kept warm. Ideally keep the batteries in your pockets and load them up only when you are going to shoot. They drain off very fast in the cold. I went with my brother Vikram Singh’s company called Wild World India. They have been running Snow Leopards tours for a few years now. Organising the logistics was very easy for me as all I had to do was drop a mail to wwi@wildworldindia.com and then land up in Leh on the right date. The rest would be taken care of like clock work. They are good. I am not the fittest guy around but I can take my share of the rough. Be prepared for cold and lack of oxygen. It can get very very cold. 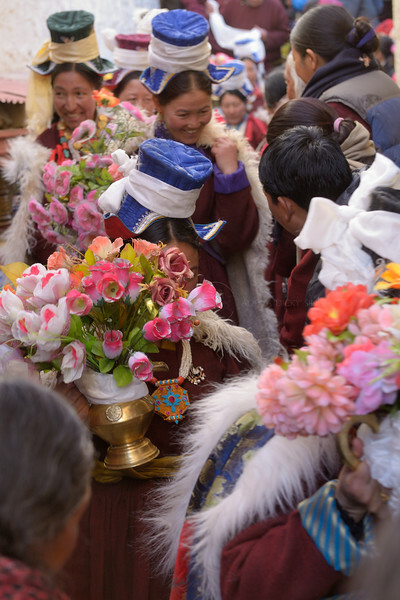 We met people who lived in places where the temperature can be as low as Hemis – from minus 15 to 25 degrees Centigrade – but they were struggling in Hemis. There is no heating (except for the small heater in the Dining tent), the wind chill can be really bad and you are living in a camping tent. One night the temperature inside the sleeping tent was measured at minus 19 degrees C. You can not hold on to metal (your lens and the camera) without gloves and shooting with gloves on is not easy. Besides the rarified air there is another factor to deal with. You are out of breath almost all the time and the bag on your back does not help. It is best to walk at your own pace and it is a very stupid idea to keep pace with the guides. They can run up slopes where you may struggle to crawl. Come with proper gear and be prepared to get hammered.